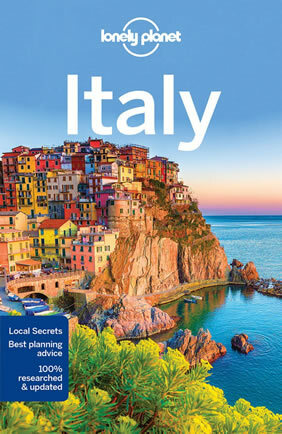 Trento, Lake Garda, The Dolomites, Merano, and more! 8 days gay tour of awe-inspiring landscapes! 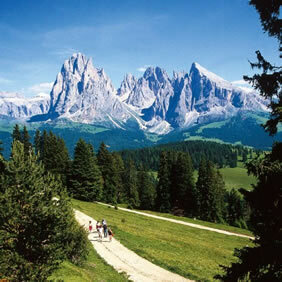 Visit the Italian Dolomites at Northern Italy for utmost best experience with nature and authentic Italian villages. This trip will show you how paradise on earth looks like. 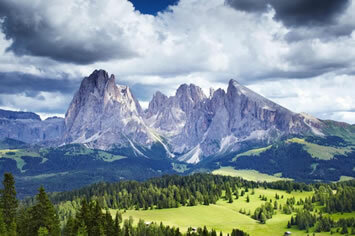 The Italian Dolomites range is a breathtaking, unbelievably beautiful region in Northeastern Italy. 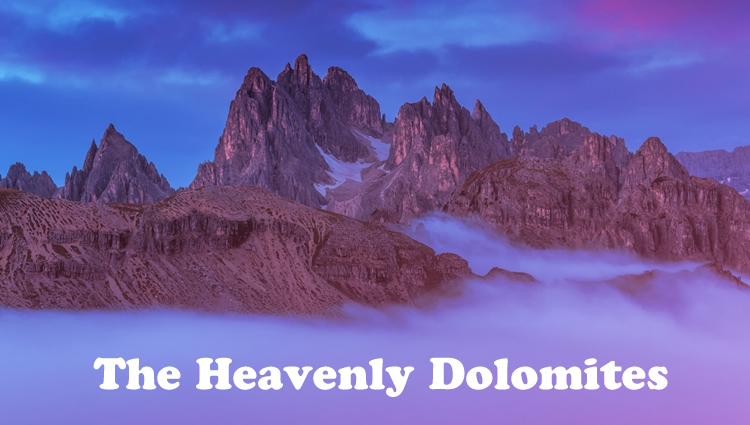 Affiliated to the Alps Range, the Dolomites rule the area with their pointed, rocky peaks and their steep, dramatic slopes. The perfect tour to witness the full force of nature combined with its delicate beauty. Italy's dramatic rocky rooftop, the Dolomites, offers some of the best mountain thrills in Europe. The bold, light-gray cliffs and spires flecked with snow, above green, flower-speckled-meadows and beneath a blue sky, offer a powerful, unique, and memorable mountain experience. Here, the region's Austrian history survives in a warm, blue-aproned, ruddy-faced, felt-hat-with-feathers way. There's yogurt and yodeling for breakfast, and most locals are bilingual German-Italian speakers. The city of Bolzano — blending Austrian tidiness with an Italian love for life — is the gateway to the Dolomites. And the village of Castelrotto is a good home base for your exploration of the Alpe di Siusi, Europe's largest alpine meadow. 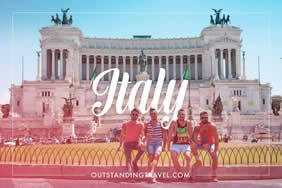 Welcome to the amazing Northern Italy! 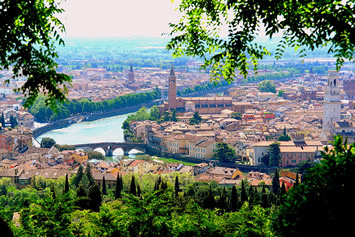 A private transfer will take you from the airport in Verona to your hotel in Trento. Following breakfast head to the beautiful Lake Garda. Explore the charming western side of the lake with a walking tour of Limone del Garda. This town sits on a narrow strip of land at the foot of the tall and rocky cliffs, famous for its lemon groves. Visit the famous Castle's lemon groves and taste lemon-based products. Continue to the famous Cascate di Varone and Lake Tenno for one of the most beautiful hamlets in all of Italy! Finish this lake day in Lake Toblino, the setting of many Italian films. Get back to your hotel an overnight. After your breakfast meet your guide for a walking tour of Trento following the wine route. Discover the unique charm of a Renaissance Alpine city, where history is art. The City of the Council (1545 - 1563) still keeps its precious monuments as tokens of its rich artistic and historic heritage. Admire the Castello del Buonconsiglio, the Duomo, its splendid piazza and fountain dedicated to Neptune and Trento’s many highlights to grasp the city’s full magnitude. 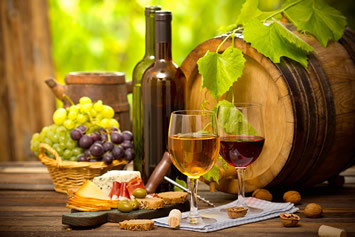 Continue to the wine route with a visit to a wine cellar in Tramin area for wine and delish local products tasting. Afterwards arrive to the city of Bolzano - the perfect combo of the Northern European lifestyle with the Mediterranean influences, both can be seen from its rich architecture and art. For centuries, Bolzano was the center of commercial hub between Italy and Germany. A walking tour of the old town will take you to the market square (Piazza delle Erbe), heart of the city, the Medioeval Arcades and the Gothic Cathedral. 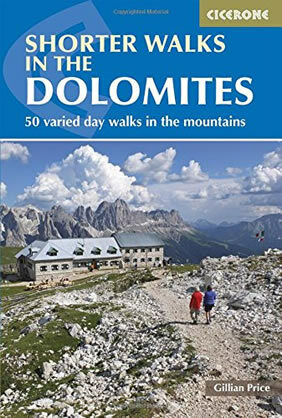 After breakfast meet your tour guide and start your excursion to the UNESCO site of the Dolomites. A drive through the Val D'Ega will get you to the beautiful Lake Carezza where you will be wowed by the magnificent views of the mountain ranges. Through the Fassa Valley and Gardena Valley you will be amazed by the alpine villages and mountains. In the town of Ortisei get the local experience with a woodcarving workshop to learn about this longlasting artcraft, typical for this area. Seal the day with tasting a delicious common southern Tyrol dessert - the Strudel together with a real Italian coffee. Return to the hotel for an overnight. 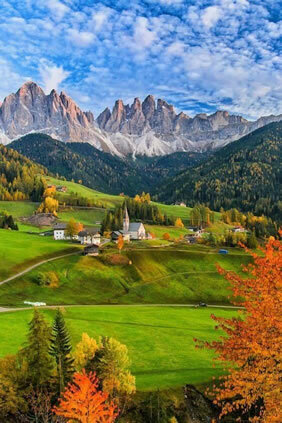 Following breakfast meet your guide and get ready to visit one of the most beautiful places of the Dolomites - The Funes/Villnöss valley. Visit the little Church of San Giovanni in Ranui - one of the last remaining pristine valleys where you can enjoy amazing views. 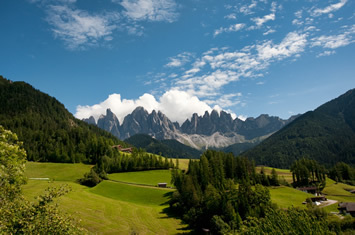 Start your trekking tour (medium difficulty) to a real Souther Tyrol Maso (Farmhouse) where amazing landscapes await. Get back to the starting point and transfer back to the hotel. After breakfast head with your driver to the magical Lake Braies, a small alpine lake between the Dolomites. 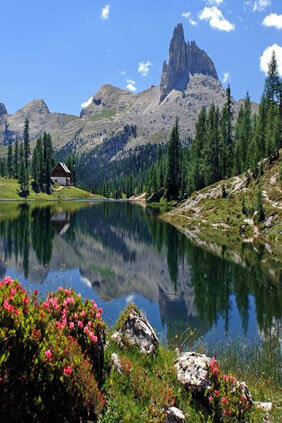 The lake, also known as the 'pearl of Dolomites' lakes', hides a legend about the creation of the lake. Take your time and enjoy this serene lake with the dramatic steep slopes of the mountains. Exlporing the area by horse riding is also available in one of the horse farms nearby. 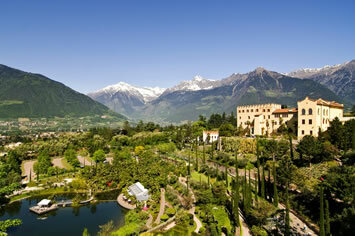 After breakfast meet your tour guide and head to Merano, the spa town. A short walking tour of this city will take you on the meeting point of the Alps and the allure of the South - a place where the barrenness of the high mountain terrain is quietened by lush Mediterranean vegetation. Continue to Trauttmansdorff Gardens where Empress Sissi from Austria had her health & spa stays. In the afternoon leisure in the famous thermal baths of Merano for the utmost indulgence to give a great finish to a great trip! After breakfast, transfer back to the airport in Verona for your flight back with everlasting memories of an amazing trip! 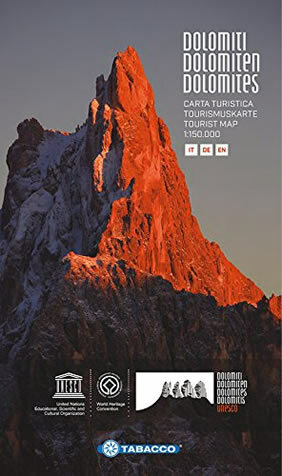 Select from 3 different category Trento, Bolzano, Val Gardena & Merano hotel options. The NH Trento hotel is a brand-new hotel in the complesso Le Albere area. The whole area – including the hotel itself – was designed by famed architect Renzo Piano, and is surrounded by beautiful scenery in a tranquil area. The hotel sits on the Adige river, with partial views of the Alps and nearby parks. Featuring free WiFi and a fitness center, NH Trento offers accommodations in Trento. Guests can enjoy the on-site bar. Private parking is available on site. Each NH Trento Hotel room at this hotel is air conditioned and features a flat-screen TV. Certain units have a sitting area for your convenience. You will find a kettle in the room. Each room comes with a private bathroom equipped with a bidet. For your comfort, you will find free toiletries and a hairdryer. Try authentic Italian cuisine at the Il Concilio restaurant, including some specialties from the Trentino region. After dinner, enjoy a quiet drink at the relaxed hotel bar that’s open until midnight. At breakfast, the restaurant lays on a delicious continental buffet with hot dishes also available. Set in the heart of Bolzano, 202 m from the cathedral, Parkhotel Laurin is surrounded by a beautiful park where you can dine on warm, summer evenings. This elegant hotel dates back to 1910 and is built in the Art Nouveau style. Each room features designer furniture and original artwork by contemporary artists. The 100 spacious rooms and suites are embellished with original works by contemporary artists and each exudes its own personal charm. Superior amenities include a conference centre, the elegant Laurin Restaurant, the congenial Laurin Bar with its smokers’ lounge and the extensive private park with a heated swimming pool. You can enjoy a varied mix of regional and Italian cuisine at the Parkhotel Laurin restaurant, which opens out into the garden during the summer. The Laurin Bar has original Art Nouveau frescoes and a relaxing atmosphere, ideal for a quiet drink. Under the renowned architects Boris Podrecca and Albert Mascotti there were created rooms and suites furnished in four different architectural styles, using only the best materials. Each room is decorated with original paintings by 20th century artists. The suites are all south-facing, with views over the park. Some rooms offer balconies. All rooms and suites offer luxurious modern bathrooms, in marble. Showcasing a sun terrace and views of the mountains, Hotel Sporting is located in Selva di Val Gardena in the region of Trentino Alto Adige, just 46.7 km from Merano. The hotel has a spa center and ski storage, and guests can enjoy a meal at the restaurant or a drink at the bar. Free WiFi is featured and free private parking is available on site. Whether it is sunny or bitterly cold outside, the atmosphere at the Sporting Hotel in the UNESCO World Heritage Dolomites is always warm and welcoming. A flat-screen TV with satellite channels and DVD player, as well as an iPod docking station and a CD player are provided. Certain units have a sitting area for your convenience. A balcony or patio are featured in certain rooms. Each room comes with a private bathroom. For your comfort, you will find bathrobes, slippers and free toiletries. Free use of bicycles is available at this hotel and the area is popular for skiing and biking. Bolzano is 30.6 km from Hotel Sporting, and Cortina d'Ampezzo is 29 km from the property. Featuring free WiFi, a seasonal outdoor pool and a sun terrace, Villa Eden Leading Park Retreat offers accommodations in Merano, just 22.5 km from Bolzano. Guests can enjoy the on-site restaurant. Free private parking is available on site. During your stay at Villa Eden you can take part in a full program of physical activity. You can participate in a healthy session of muscle toning every morning, surrounded by the quiet of the park, while in the afternoon we propose yoga classes and water aerobics. If you prefer to stay in shape with weight training, we offer our fully equipped gym so you can work out with a qualified personal trainer. Hiking, biking and golf also awaits you, to practice in the midst of the unique beauty of nature. A flat-screen TV and DVD player, as well as an iPod docking station are featured. Some accommodations include a sitting area to relax in after a busy day. Every room is fitted with a private bathroom. For your comfort, you will find free toiletries and a hairdryer. At Villa Eden waits you will find three dining rooms, lovely and elegant salons decorated in Art Nouveau style, where you can enjoy a revitalizing buffet at breakfast and low-cal typical cuisine of Merano and South Tyrol for lunch and dinner. This property is a 19-minute walk from the beach. Featuring free WiFi, a spa center and a seasonal outdoor pool, Grand Hotel Imperial offers accommodations in Levico Terme, just 16.1 km from Trento. Guests can enjoy the on-site restaurant. Free private parking is available on site. However you picture your personal dream holiday, you will come closer to your image of it than probably anywhere else at the Imperial Grand Hotel in Levico Terme thermal spa resort. Do you like being pampered? Would you like to know that your health is being professionally nurtured? Perfect! As trained personnel and professional equipment are available to you for heavenly spa and wellness stays at our hotel. Each room has a flat-screen TV. Certain units have a sitting area to relax in after a busy day. Every room includes a private bathroom. For your comfort, you will find free toiletries and a hairdryer. Would you like to wallow in imperial splendour? Do you like strolling along well-maintained paths in parks? Fabulous! As the Imperial Grand Hotel, once built as the holiday residence for the Austrian imperial family, exudes feudal charm. Does the sight of blue lakes in front of magnificent mountain scenery make you swoon? Do good air and attractive day trip destinations pique your spirit of adventure? Wonderful! As the stunning area of the North Italian Alps is made for people like you – people who know how to enjoy life! Hotel Stiegl Scala is a perfect mix of old-world charm and modern design, close to Bolzano Station. Dating back to 1898, the hotel boasts a beautiful garden with swimming pool. This historic hotel has undergone a number of refurbishments over the years and provides all the latest amenities. Each room comes with free Wi-Fi and some overlook the surrounding hills and vineyards. Start your day at the Stiegl Scala with a generous breakfast out on the patio. The hotel features a bar and lounge. The elegant salon dates back to the 1920s when it was a reading room. The wood-paneled bar has a much more rustic atmosphere. Enjoy traditional, regional cuisine at the restaurant. The hotel is ideally located for enjoying all that Bolzano has to offer, close to the most popular shops and the cable cars. Your hotel in the city center, perfect for discovering Trento: Simply Different! In the historic center of Trento, a few steps from Castle Buonconsiglio and the Duomo; Hotel America Trento offer cozy spaces, exclusive services and a staff dedicated entirely to you. Business, culture, art, events, nature, sports... all at your fingertips! At the Hotel America in Trento, you will be absorbed by the historical center of the city, 80 steps from the Roman city with its history, the castles and the wonder of the new MuSe - Science Museum of Trento... and do not forget to do shopping in stores downtown! All America Hotel rooms include a TV. You will find a kettle in the room. Each room includes a private bathroom equipped with a bathtub or shower. For your comfort, you will find free toiletries and a hairdryer. The Bar "El Merican" within the Hotel America Trento, is the perfect place to make pleasant your every meeting, will welcome a wide range of refreshing beverages, accompanied by delicious desserts and to end the day, we pamper you with cocktails created ad hoc or with the energizing centrifuges depending on your mood! The Hotel Citta, with its elegant Café-Restaurant-Bar, is found directly on Piazza Walther von Vogelweide, Bolzano’s main square named after the famous medieval troubadour. Considered the salotto buono of Bolzano, i.e. its fashionable and chic district, the square and surrounding streets are part of the town’s refined and lively pedestrian zone with restricted traffic access. A peaceful and stylish atmosphere characterizes the Hotel's spacious and finely furnished interiors. The building's historic charm is combined to all the modern conveniences offered by Hotel Città: 99 spacious and comfortable rooms, all with wooden flooring, free Wi-Fi internet connection, lift to all floors, wellness centre with saunas, steam bath, whirlpool, Kneipp therapeutic pool and relaxation room. Every room comes with a flat-screen TV with satellite channels. Every room has a private bathroom. For your comfort, you will find slippers, free toiletries and a hairdryer. Stadt Hotel Citta cafe & restaurant in the morning for a coffee, a croissant and the latest news from the world, later for an “aperitivo”. At midday for a quick snack or a full meal; later for an ice cream, a hot chocolate or a “Sfizio & Wine”, while looking at people going by on piazza Walther. And when it gets dark? For dinner, drinks and some nice music. 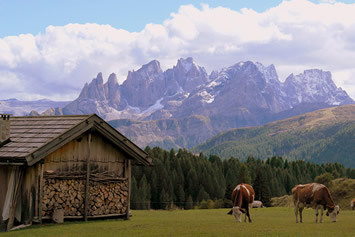 Chalet Madrisa offers beautiful views of the Dolomites, free parking, and rooms with satellite TV. 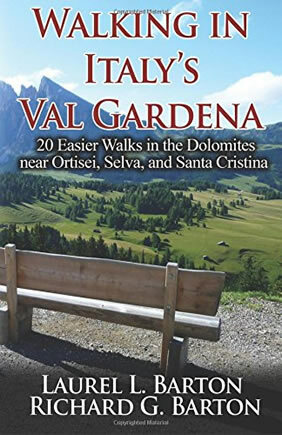 It is 92 m from the ski lift, and a 2-minute walk from the center of Corvara in Badia. Corvara is the undisputed tourist centre in Alta Badia and, with its modern accommodation and entertainment facilities, it is one of the most popular holiday destinations in the Alpine region. The rooms of the Madrisa include elegant parquet floors and a private bathroom with shower. Free Wi-Fi is available in the lobby. Breakfast in Chalet Madrisa is a sweet and savoury buffet including traditional cold cuts of South Tyrol. The bar with outdoor tables serves tasty sandwiches. Tradition and modernity in perfect harmony: this goes not only for the Alpine spa resort town, but also for Europa Splendid Merano hotel. The charming art deco building offers every comfort one could wish for during a city break. You’ll find the Therme Merano, the beautiful promenade and the medieval Lauben covered arcades, which afford wonderful shopping options, just around the corner. City hotel’s soundproofing ensures that you’ll find real rest and relaxation; when and as you wish, all you have to do is step outside and you’ll be right in the middle of it all, enjoying all the advantages of prime location. Every Europa Splendid Hotel room comes with a TV. Some rooms feature a sitting area to relax in after a busy day. The rooms have a private bathroom. For your comfort, you will find free toiletries and a hairdryer. Breakfast - the most important meal of the day. Thanks to our breakfast buffet, with various fresh local products to choose, your day can begin with vigour. You can also order à la carte scrambled eggs, crepes and a lot more. 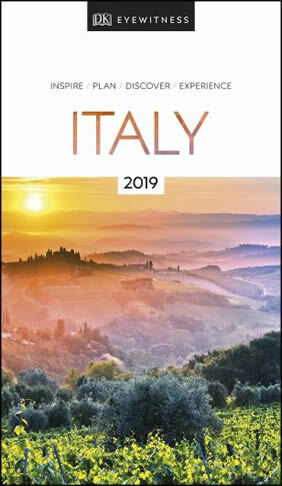 • Entrance fees to the following sites: Castle’s Lemon Plantation, Cascate del Verone, Trauttmansdorff Gardens in Merano, Thermal Baths + Sauna in Merano.